We are delighted to offer you this CERTIFIED PRE-OWNED 2016 TOYOTA COROLLA S PLUS which was recently traded in to our dealership. 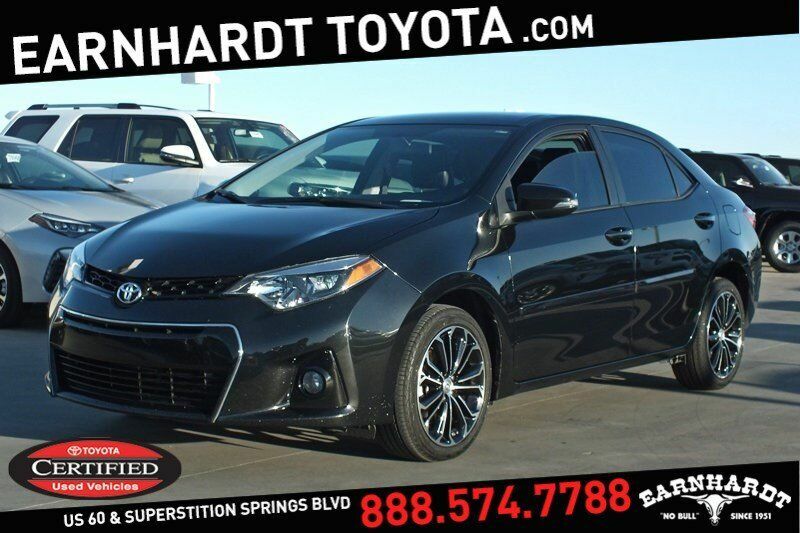 This has been owned in Arizona since new and has an accident-free Carfax report. This has 17" factory wheels and the tires have good tread on them. The Black Sand Pearl exterior shows nicely with no paramount damages or flaws in the paint. The Steel Blue upholstery is in good condition with no serious wear or tears present. This currently has 45k miles and is an affordable sedan that you're going to appreciate owning! Features include power windows, tilt wheel, cruise control, hands-free phone capable, steering wheel audio controls, AM/FM/CD player, backup camera, cup holders, console, stability control, traction control, ABS, dual airbags, daytime running lights and more. Certified Pre-Owned means you not only get the reassurance of a 12 month/12,000 mile Limited Comprehensive Warranty, but also up to a 7 year/100,000 mile Limited Powertrain Warranty, a 160-point Quality Assurance Inspection, 1 year Roadside Assistance, trip-interruption benefits, rental car benefits and a complete Carfax vehicle history report.